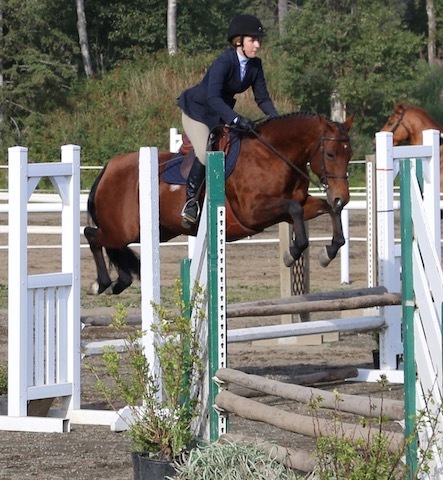 We offer beginning through intermediate jumping lessons, with a focus towards college and work study programs. We also offer Dressage lessons through second level, and we have opportunities based on space available for cross-country. I have limited availability for my lesson program during the school year. Lessons are either private, or semi-private. Lessons run Tuesday, Wednesday, Thursday from 1:00-6:00. During the school year. I have increased availability in the summer months. Interested clients can get on a cancellation list if there aren't regular lesson spots available. Lessons must be purchased monthly in blocks to hold a regular lesson space. Lesson fees due the 1st of the month. If a rider is sick the lesson may be made up by the end of that month, or if in the last week, the following month. If a rider misses for any other reason the lesson will not be made up. If the instructor cancels for any reason lessons will be refunded on the following months bill or will be made up within thirty days. Horses have been my passion from day one. I have been teaching riding for 20 years, I began my riding career with my first lessons at the age of four. I attended regular weekly lessons at a hunter jumper barn in Colorado Springs. We moved to Washington State in 1989, and I got my first horse Chelsea. I was in regular training at Twin Maples farm at that time, my instructor focused on correct riding, we did many A rated hunter jumper shows, as well as a number of cross country events. Following that, I had many wonderful instructors over the years, I competed all over the Northwest, and I was also actively involved in Pony Club. When I graduated high school I took a year off to be a working student for Elenore Elstone. I spent five days a week driving up to Langley, BC to help her work horses in training. It was through her that I developed a solid foundation and love of Dressage. It was also my most extensive experience working with stallions. I have been teaching for twenty years, and I enjoy developing the relationship between horse and rider. I am regularly continuing my education with clinics that I attend, as well as taking lessons from top horse trainers when I can. My goal is to be able to help people develop a solid foundation in riding from the ground up. My number one priority is the sound care and happiness of our horses. So I keep my lesson program small, so that our horses are always looking forward to work. I usually start new riders out on a longe line, in order to develop a correct leg and seat. My program focuses on teaching riders to have solid balance and an independent seat and hand. Each rider's journey is a new puzzle for me to pull out the best in them. We pride ourselves on having a drama free barn. We are a barn family, and we strive to keep a peaceful happy team. Our barn is an Oasis. Molly and Jim are the property owners of Wildwood Stables, they have dedicated countless hours to the maintenance and care of the property and horses. After over thirty years working with horses, I have come to learn with certainty that you are never done learning. There is no real mastery of this sport, it is always evolving, and perfection is the elusive goal. These girls helped start it all with Wildwood Stables. Erin went on to become the Captain of the Dartmouth College Equestrian team. Kelsey is still in the riding program with her pony Pepper.